It’s about that time! 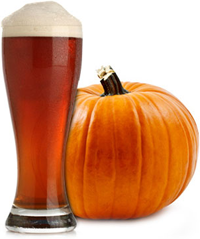 Every fall my husband and I buy a variety of pumpkin beers. We build a fire out on the patio and do our own tasting—we sometimes do the same thing with Octoberfest beers. That could come next month. But back to pumpkin. I plan to take notes and photos of the ones I like this year. Sweetwater Tavern is a restaurant that is part of a DC-area chain that also brews some pretty good beers. Their Ghost Town Pumpkin Ale is my favorite (and has been my Trick-or-Treat beverage every Halloween). Dogfish Head Alehouse has a Punkin Ale is another good one. But some we had last year were not exactly memorable and a few were not something I cared for at all. One was a pumpkin porter from Maine. It was so bad (in my opinion) I dumped the remainder of what I had into the grass. That night is when we discovered our dog Hubert loves beer. Once we get a free weekend evening we’ll do our tasting and I will report back. Has to be a weekend, as some of these beers have pretty high alcohol content. I just can’t work with a fuzzy head. In the mean time, I’d like to get any recommendations. And if you haven’t tried it yet, there’s an app called Untappd where you can log in and see what your friends are drinking, take pictures and post your own tasting ratings, and helps you find bars nearby and even what they have on tap (if they are serious about beer).